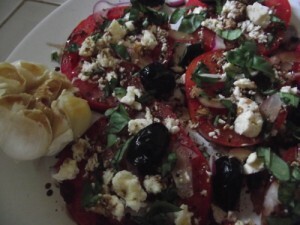 This salad is an absolute favorite of mine because of the combination of rich fresh flavors. It looks impressive at dinner but is deceptively easy to make for large or small groups. There is another version here that I also love and that is easier to eat if you’re serving it at a cocktail or appy party. Arrange the tomatoes and then top with all other ingredients. Season with lots of fresh black pepper, a sprinkle of salt and then drizzle with about a tbsp of olive oil and 2 tbsp of balsamic vinegar.